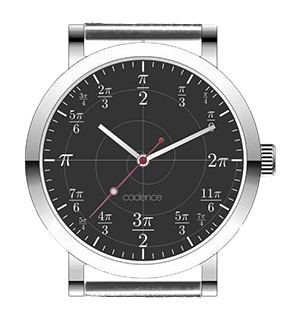 Catching the spirit of Pi Day, The Cadence Watch Company is pleased to announce the launch of their mathematically inspired Radian Watch. Instead of standard Arabic numerals, the Radian Watch features radians, another mathematical ratio (expressed as factors of Pi), on the hour marks. A subtly flowing Archimedean spiral provides added math style and makes this the perfect watch for Pi Day, and a great gift or purchase for math minds everywhere. With its 4-Bit watch line, Cadence is on the forefront of geek chic and the Radian watch is another celebration and affirmation of geek culture. In this day and age, watches are more than just a way to tell the time. Great watches make a statement, and the unique Radian watch will subtly boosts your geek cred without sacrificing style and wearability. The Radian watch is more than just a superior timepiece, it is a conversation piece as well. “In designing the watch, I knew that math aficionados would have no trouble telling the time, and so focused on crafting an original watch that is sure to stand out,” says watch designer Christopher Thompson. “I called out the angle measurements at each of the hour positions and stuck the eighths in there too. I put the subtle Archimedean spiral in the background because it's looks cool and graphs the equation r = a + bθ. 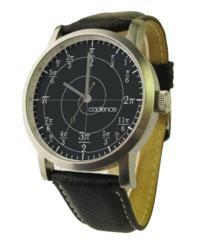 Math geeks like me will love this watch." It’ll be on your wrist well before Pi Approximation Day (22/7, or July 22... get it?)! Instead of Arabic numerals, the hour marks on the Radian watch are expressed radians – the standard unit of angular measure, used in many areas of mathematics. It's the perfect gift for math geeks. Pi (the Greek letter π) is a mathematical constant, an irrational number that is the ratio of a circle’s circumference to its diameter. Although calculated to several trillion non-repeating integers, Pi is often expressed by its first three integers: 3.14. In month-day date notation, this represents March 14, which also happens to be the birth date of Albert Einstein. According to a 2011 article in the San Francisco Chronicle, Pi Day was created in 1988 to attract visitors to the San Francisco Exploratorium. The designation has caught on: on March 12, 2009, the U.S. House of Representatives passed resolution HRES 224 recognizing March 14 as National Pi Day. The following year, Google presented a Google Doodle celebrating the holiday. Princeton University organizes an annual celebration and schools and science institutions across the nation are getting into the math fun too. The Cadence Watch Company designs, makes and sells high-quality watches at revolutionary prices. The company started in 2001 by making a patented stroke rate monitor for rowing, and has expanded into a full and growing line of branded performance and lifestyle watches, including the trademarked 4-Bit line of watches for geeks and the in-the-know 4:20 line. By cutting out middlemen in watch distribution, Cadence can deliver eye-catching designs at eye-popping prices. For more information, visit cadencewatch.com.